New Linlithgow Rose boss Mark Bradley will use his side’s remaining three games to assess his squad before deciding what changes to make. 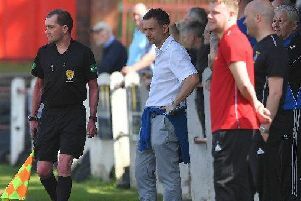 Bradley this week returned to Prestonfield where he guided to Rose to a Superleague title - after an unbeaten league campaign - and a Scottish Junior Cup final in his first spell as manager from 2011 to 2014. The former Hearts player is aware that a massive improvment is needed after a dismal season by the club’s standards. But he says he will give all his players the chance to show what they can do before deciding how much of an overhaul is needed. Rose, now safe from relegation, have three league gamnes still to play, beginning with Saturday’s visit to Lochee United. Bradley said: “It’s a requirement when you get the job that there has to be success and the club’s been starved of that for a couple of years, which isn’t ideal and not what they’re used to. “For the players there’s a lot of them out of contract. It’s something the boys have to keep focussed on, they can’t switch off, even though there’s really to play for any more, apart from pride. “The contract situation demands that they keep themselves in the team and show the new management team that they should be there because it’s not been a successful season. However Bradley added: “We’ll not just be giving numbers out to say we’re overhauling this amount, everybody will be given a chance in the next three games and then we’ll make a call on that at the end of the season. “We have to get back to being the main club. We’ve lost that mantle over the last few years by other teams kicking on and us not being successful, so we need to get back to being the team that everybody wants to beat. But we’re only going to get there if we work hard and get our home record back up to where it should be, and it’s always been for Linlithgow teams of the past. “The club don’t hide the fact that they want to be winning the league, winning the Scottish Cup and having a good run in the senior Scottish Cup. The demands are always there no matter who is in charge.